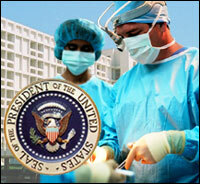 President Barack Obama and his administration have released their Health Care reform plan. WASHINGTON, D.C. – President Barack Obama’s administration has released details on its proposal for overhauling the U.S. health care system. The plan, which would give nearly 90% of American’s free health care, is centered around reducing the number of Americans via free abortions and free assisted suicides. “I know those whack-job conservatives get all up-in-arms about killing babies and old people, but really, if we are going to have free health care, there needs to be a lot less people,” said Democratic Senator, Ron Wyden of Oregon. “We can reduce the number of people pretty easily on both ends of the lifecycle. We reduce the number of babies born every year and we increase the number of people dying every year. That way, we only have to worry about ourselves… and really, isn’t that the American way? In addition to free abortions and assisted suicides, Obama’s plan would also allow any patient see any doctor for any reason. A number of high ranking Republicans have come out against the plan saying that it not only socializes health care, but also because it encourages the killing of babies and old people. Despite the resistance from most of the Republican Party, an overwhelming majority of Americans support the plan. A Scoop News survey found that 83% of Americans support universal health care even if it includes free abortions and euthanizations.